Battery, autonomy LiIPo rechargeable battery (external charger), 1800 mAh. The e-puck2 robot maintains full compatibility with its predecessor e-puck, but there are some improvements that you should be aware of. First of all the e-jumper, that is the small board that is attached on top of the e-puck1.x, isn't anymore needed in the e-puck2. 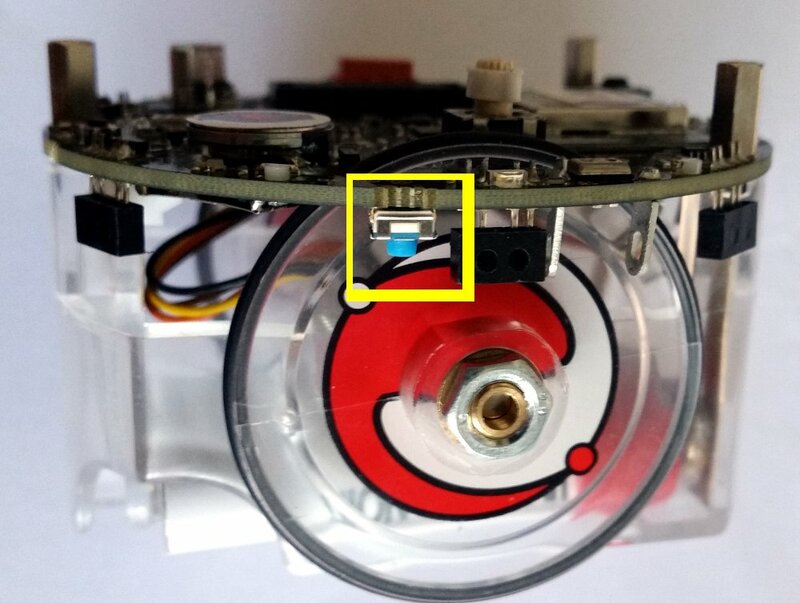 The components available on the e-jumper are integrated directly in the robot board. On top of the e-puck2 you'll see a quite big free connector, this is used to attach the extensions board designed for the e-puck1.x that are fully compatible with the e-puck2; you must not connect the e-jumper in this connector. Secondly you don't need anymore to unplug and plugin the battery for charging, but instead you can charge the battery (up to 1 ampere) directly by connecting the USB cable. If you want you can still charge the battery with the e-puck1.x external charger, in case you have more than one battery. Moreover you don't need anymore a special serial cable (with probably an RS232 to USB adapter) to be able to communicate with the robot, but you can use the USB cable. Once connected to the computer a serial port will be available that you can use to easily exchange data with the robot. All the extensions (ground sensors, range and bearing, RGB panel, gumstix and omnvision) are supported by the e-puck2 robot, this means that if you have some extensions for the e-puck1.x you can still use them also with e-puck2. For more information about using the gumstix extension with e-puck2 robot refer to http://www.gctronic.com/doc/index.php?title=Overo_Extension#e-puck2. The robot is shipped with the last firmware version programmed on all 3 chips, so you can immediately start using the robot. The following sections explain the basic usage of the robot, all the users should read this chapter completely in order to have a minimal working system ready to play with the e-puck2 robot. Some sections will have more detailed information that can be read by following the links provided. When required, dedicated informations are given for all platforms (Windows, Linux, Mac). The commands given for Linux are related to the Ubuntu distribution, similar commands are available in other distributions. To turn off the robot you need to press the power button for 1 second. The e-puck2 has three groups of LEDs that are not controllable by the user. STATUS: Turned ON if the robot is ON and OFF if the robot is OFF. When ON, gives an indication of the level of the battery. Also blinks GREEN if the program is running during a debug session. The robot is automatically turned OFF if the system's tension gets below 3.2V during 10 seconds. A micro USB cable (included with the robot in the package) is needed to connect the robot to the computer. There are two connectors, one placed on top of the robot facing upwards and the other placed on the side of the robot, as shown in the following figures. Both can be used to charge the robot (up to 1 ampere) or to communicate with it, but do not connect two cables at the same time. Connect the USB cable where is more comfortable to you. Connect the e-puck2 with the USB cable and turn it on. Three unknown devices appear in the device list of the program, namely e-puck2 STM32F407, e-puck2 GDB Server (Interface 0) and e-puck2 Serial Monitor (Interface 2). For each of the three devices mentioned above, select the USB Serial (CDC) driver and click on the Install Driver button to install it. Accept the different prompts which may appear during the process. At the end you can simply quit the program and the drivers are installed. These steps are illustrated on Figure 3 below. The drivers are automatically installed with Windows 10, Linux and Mac OS. Anyway in Linux in order to access the serial ports, a little configuration is needed. Type the following command in a terminal session: sudo adduser $USER dialout. Once done, you need to log off to let the change take effect. e-puck2 GDB Server. The port used to program and debug the e-puck2. e-puck2 Serial Monitor. 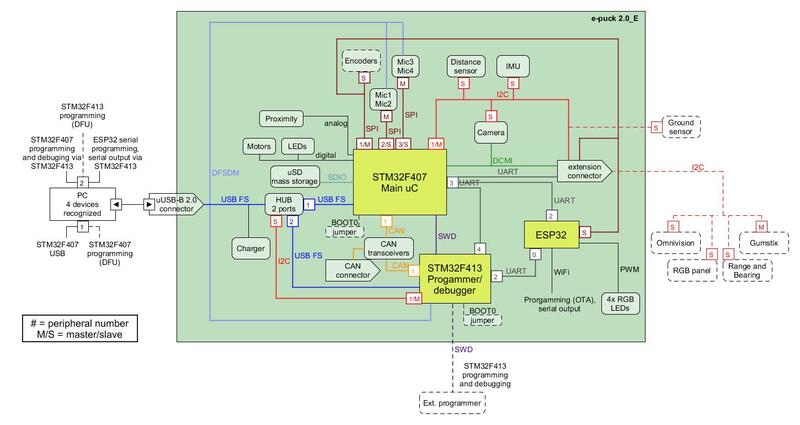 Serial communication between the PC and the radio module (used also to program the radio module). A third port could be available depending on the code inside the e-puck2's microcontroller. 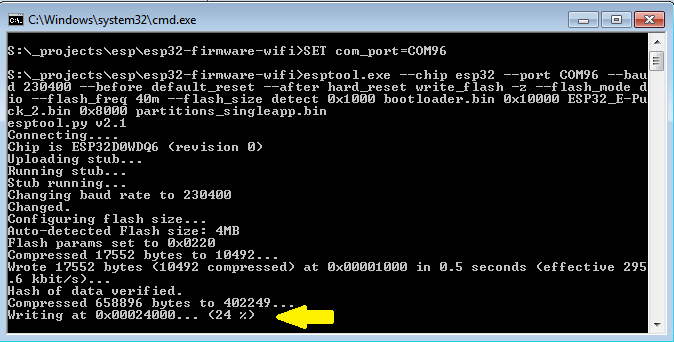 With the factory firmware a port named e-puck2 STM32F407 is created. Under Ports (COM & LPT) you can see the virtual ports connected to your computer. Do a Right-click -> properties on the COM port you want to identify. Go under the details tab and select Bus reported device description in the properties list. The name of the port should be written in the text box below. 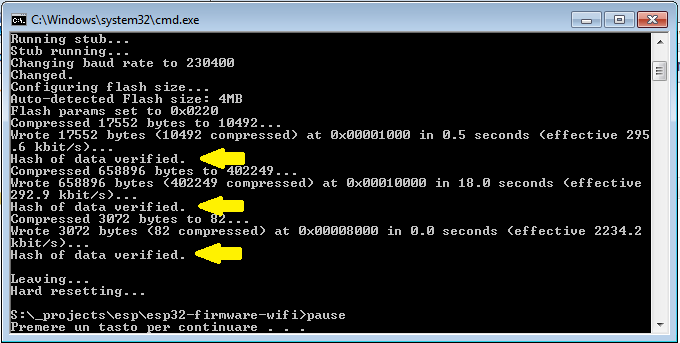 Once you found the desired device, you can simply look at its port number (COMX). Note : Virtual serial port numbering on Linux depends on the connections order, thus it can be different if another device using virtual serial ports is already connected to your computer before connecting the robot, but the sequence remains the same. Note : Virtual serial port numbering on Mac depends on the physical USB port used and the device. If you want to keep the same names, you must connect to the same USB port each time. 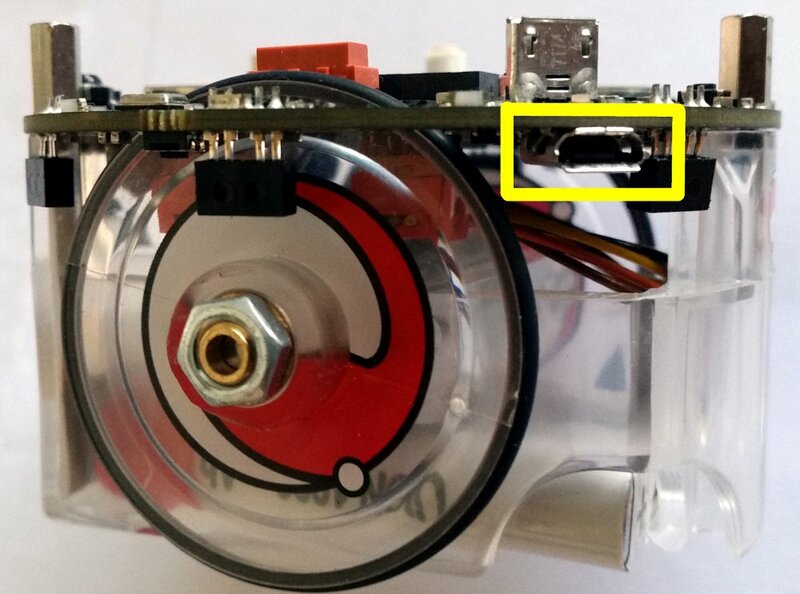 A PC application was developed to start playing with the robot attached to the computer via USB cable: you can have information about all the sensors, receive camera images and control the leds and motors. Beware that it's not mandatory to download this application in order to work with the robot, but it is a nice demo that gives you an overview of all the sensors and actuators available on the robot, this is a first step to gain confidence with the robot. With the factory firmwares programmed in the robot, place the selector in position 8, attach the USB cable and turn on the robot. Enter the correct port (the one related to e-puck2 STM32F407) in the interface and click connect. The source code is available from the repository https://github.com/e-puck2/monitor. On Linux remember to apply the configuration explained in the chapter Installing the USB drivers in order to access the serial port. 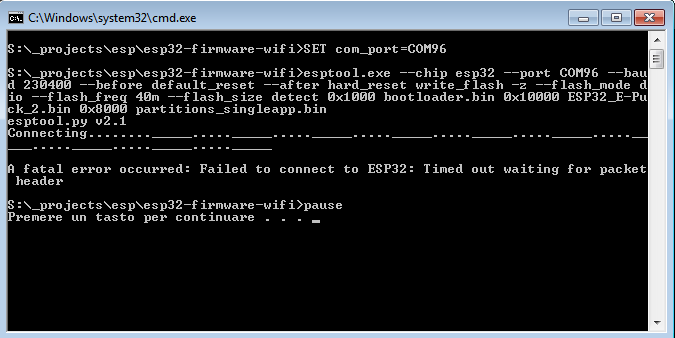 You can update the firmware for all 3 chips: the main microcontroller, the radio module and the programmer. For doing that, you need some tools to be installed on the system. 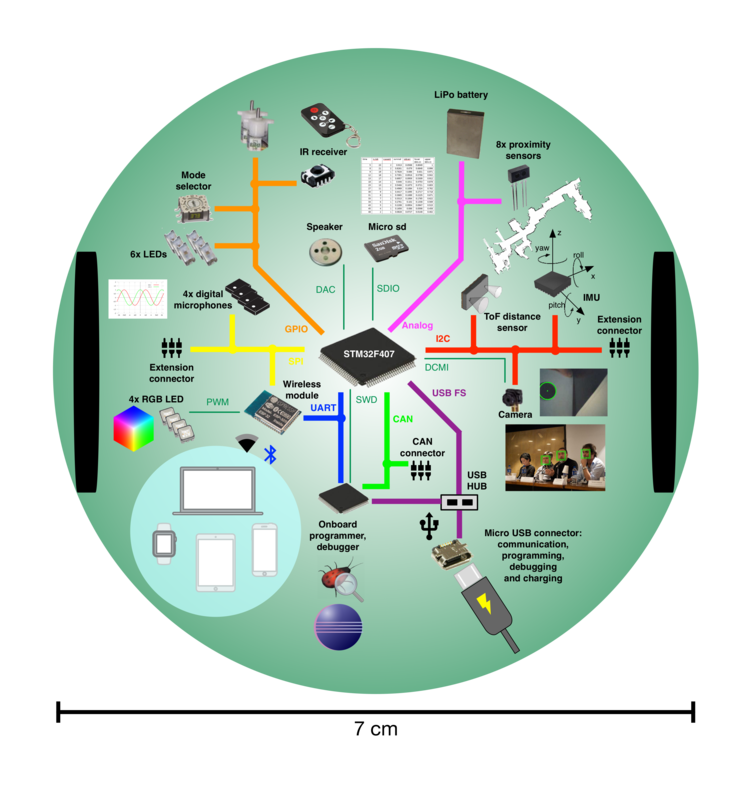 To upload a new firmware in the microcontroller or in the radio module, you don't need to install anything, the packages provided include all the dependencies. To upload a new firmware in the programmer you need to install an application called DfuSe released by STMicroelectronics. You can download it from DfuSe_V3.0.5.zip. This section is dedicated to the users that develop algorithms on the PC side and interact with the robot remotely through a predefined communication protocol. These users don't modify the firmware of the robot, but instead they use the factory firmware released with the robot. They update the robot firmware only when there is an official update. The remote control of the robot, by receiving sensors values and setting the actuators, is done through the following channels: Bluetooth, Bluetooth Low Energy, WiFi, USB cable. If you fall into this category, then follow this section for more information: PC side development. The e-puck2 robot main microcontroller is a 32-bit STM32F407 that runs at 168 MHz (210 DMIPS) and include DSP, FPU and DMA capabilities. The version chosen for the e-puck2 has 192 KB of total RAM and 1024 KB of flash, so there is a lot of memory to work with. This chip is responsible for handling the sensors and actuators and runs also the demos and algorithms. Selector position 10: In the future this position will be used to work with the Linux extensions. 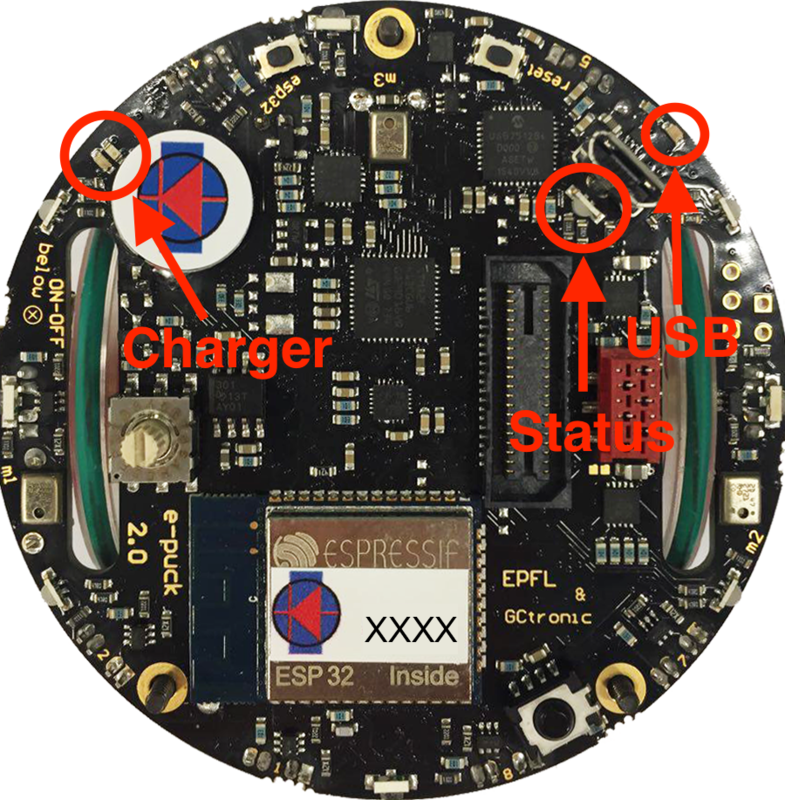 To work with gumstix refer to Overo Extension: e-puck2 , to work with PiPuck refer to Pi-puck: Robot configuration. The pre-built firmware is available here main microcontroller factory firmware (18.04.19). Now and then there could be an official firmware update for the robot and it's important to keep the robot updated with the last firmware to get possibile new features, improvements and for bug fixes. The onboard programmer run a GDB server, so we use GDB commands to upload a new firmware, for this reason a toolchain is needed to upload a new firmware to the robot. Linux/Mac: issue the following command in a terminal ./program.sh. If you get permission errors, then issue sudo chmod +x program.sh to let the script be executable. 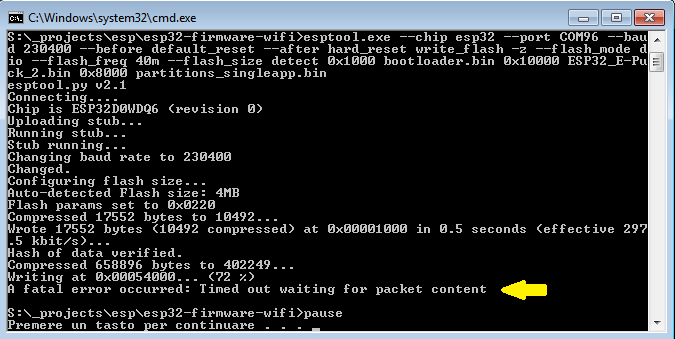 The final lines should contain the entry ".data",, this means that the upload was successfull. You can then close the terminal window if it is still open. If you encounter some problem, try to unplug and plug again the USB cable and power cycle the robot, then retry. This chip first of all is responsible for handling the wireless communication, moreover it handles also the RGB LEDs (with PWM) and the user button. The RGB LEDs and button are connected to the radio module due to the pin number limitation on the main microcontroller. The radio module of the robot is initially programmed with a firmware that supports Bluetooth communication. The pre-built firmware is available here radio module factory firmware (11.12.18). At the moment the factory firmware supports only Bluetooth, if you want to work with WiFi you need to program the radio with a dedicated firmware, refer to section PC side development: WiFi. At the moment the factory firmware supports only calssic Bluetooth, if you want to work with Bluetooth Low Energy you need to program the radio with a dedicated firmware, refer to section Mobile phone development. Sometime you could encounter a timeout error as shown in the following figures; in these cases you need to unplug and plug again the USB cable and power cycle the robot, then you can retry. Probably, you'll never need to touch the firmware running in the radio module, but in case you need to modify the code or you're simply curious about what is happening at the low level, then refer to the section Radio module development. The programmer is initially programmed with a firmware based on modified version of Black Magic Probe programmer/debugger. The pre-built firmware is available here programmer-firmware.bin (09.04.18); it is also available in dfu format here programmer-firmware.dfu (09.04.18). The programmer's microcontroller features a factory bootloader that can be entered by acting on some special pins, the bootloader mode is called DFU (device firmware upgrade). 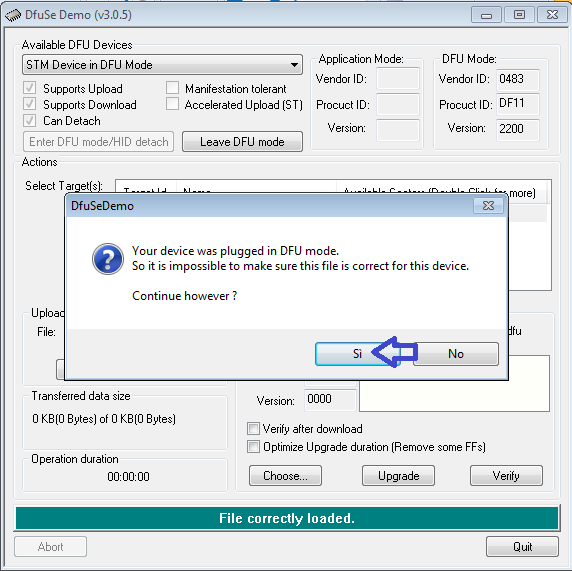 You can enter DFU mode by contacting two pinholes together while inserting the USB cable (no need to turn on the robot). 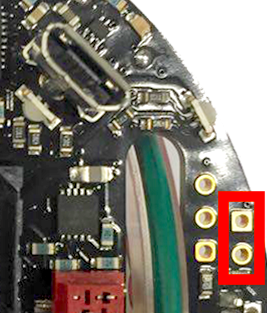 The two pin holes are located near the USB connector of the e-puck2, see the photo below. The programmer will be recognized as STM Device in DFU Mode device. Note for Windows users: the device should be recognized automatically (in all Windows versions), but in case it won't be detected then you need to install a libusbK driver for the DFU device. 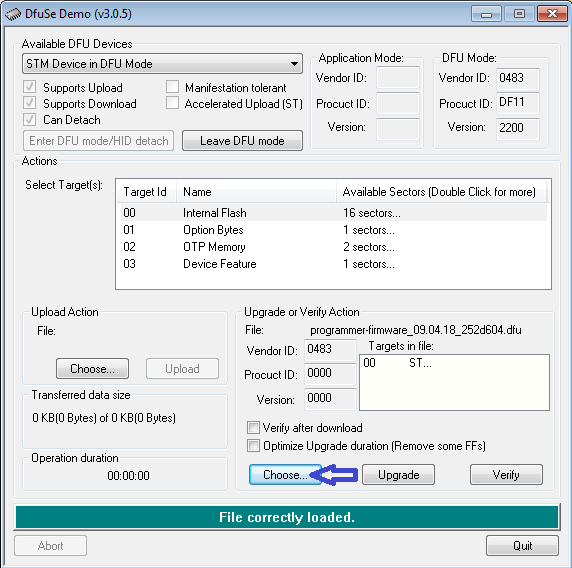 Follow the same procedure as explained in section Installing the USB drivers using libusbK driver instead of USB Serial (CDC). In order to update the programmer firmware you need an utility called dfu-util, it should be already installed from section Installing the dependencies for firmwares updates. 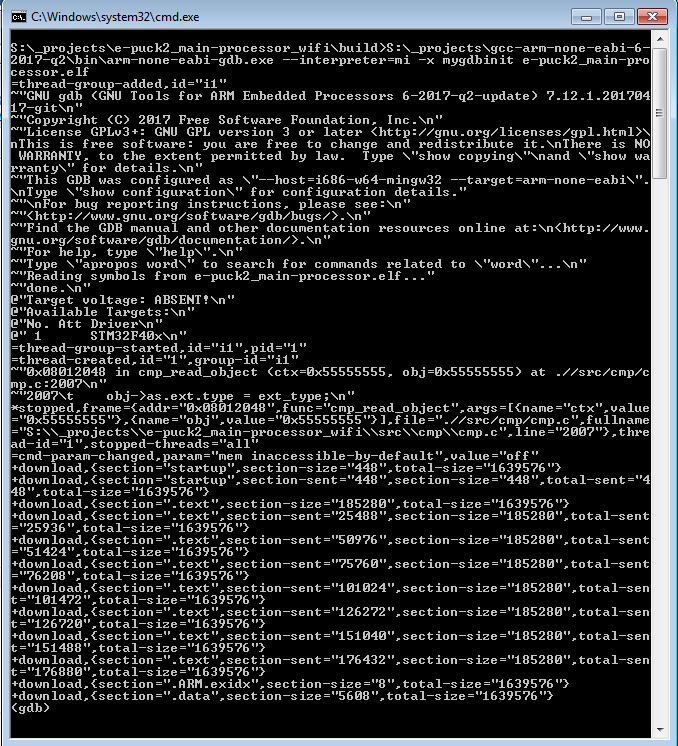 Start the DfuSe application (previously installed from section Installing the dependencies for firmwares updates). 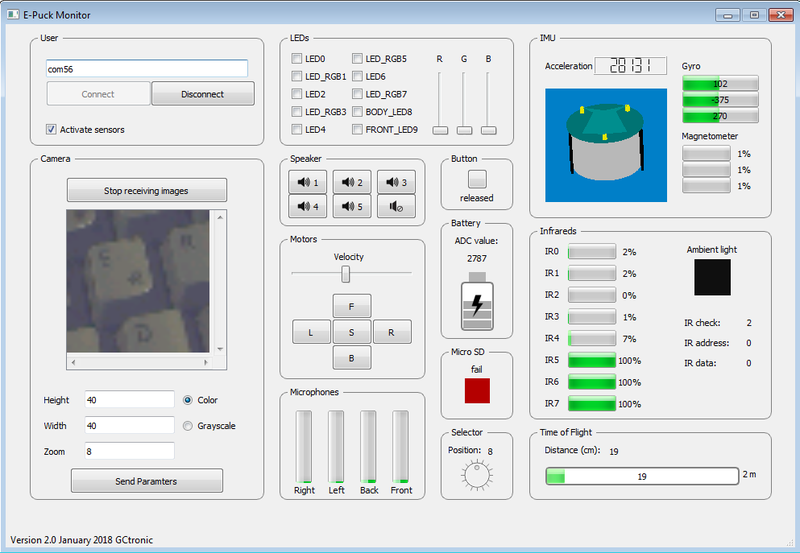 The programmer in DFU mode will be automatically detected as shown in figure 1. 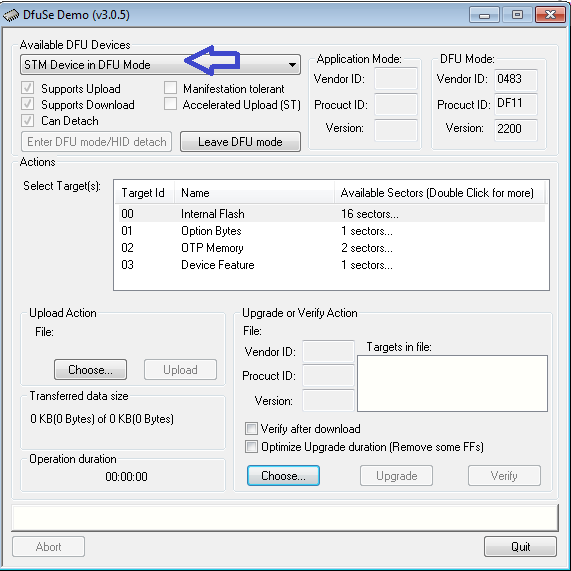 Then you need to open the compiled firmware by clicking on choose and then locating the file with dfu extension, as shown in figure 2. Now click on the upgrade button, a warning message will be shown, confirm the action by clicking on yes as shown in figure 3. If all is ok you'll be prompted with a message saying that the upgrade was successfull as shown in figure 4. The programmer code shouldn't be modified, but if you know what you're doing then refer to section Programmer development. This page was last edited on 18 April 2019, at 11:55.